Throughout their run on Darth Vader Charles Soule and Giuseppe Camuncoli have created (and/or reintroduced) a fascinating set of supporting and one-off characters, but for my money, the most intriguing is Jedi Master Ferren Barr. Last month Patrick already seemed suspicious of Barr’s methods, and in Darth Vader 17 the creative team doubles down on the shades of gray surrounding Barr. It’s the questions surrounding him and his methods that make Barr so interesting, especially as a Jedi. The Jedi, after all, are peacekeepers, and pacifists when possible. Barr still stands in heroic opposition to the Empire (who are at their most over-the-top evil this month, continuing to destroy cities even after Mon Cala’s surrender), but his strategy is decidedly un-Jedi-like. It was Barr who assassinated the Empire’s negotiator specifically to spark the conflict between them and Mon Cala, all because he saw in a vision that the Mon Calamari fleet would one day be an instrumental, essential part of the Empire’s defeat. What are we supposed to make of this? As readers with knowledge of future events, we know that Barr’s prophetic vision is 100% correct, and we’ve celebrated victories made possible by Barr’s actions. But can we celebrate his actions themselves, even as we see the death and destruction they’ve caused in the here-and-now? Should we? The morality of Barr’s strategy is decidedly gray, which is far from the Jedi code, but is quite reminiscent of the Rebels (I’m thinking specifically of Cassian Andor’s earliest scenes in Rogue One). I’d go as far as to call Barr the first Rebel, but does that make him a hero? Throughout this confrontation with Vader, Camuncoli portrays Barr as almost deranged, a zealot, which only complicates matters, but those complications are why I find Barr so interesting in the first place. He’s not an easy character to sum up. The same goes for Vader himself. My favorite moment in this issue — and perhaps in this entire run — is the final panel of the page I posted above. Vader’s “You are no Jedi” is such a fascinating bit of dialogue because the meaning behind it is, ultimately, so opaque. He’s right that Barr has abandoned the way of the Jedi, but why does Vader seem so surprised? Is he offended somehow, as if this has somehow stirred some of his old, deeply hidden light side pride? Or perhaps he’s proud of Barr’s ruthlessness? The possibilities seem endless, and each possibility is fascinating in its own way. 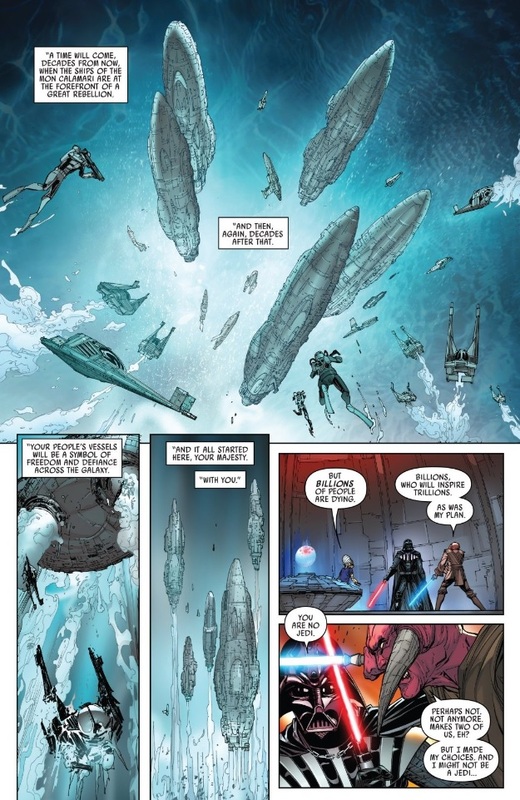 The fact that Darth Vader 17 doesn’t really have answers to any of our questions, and instead leaves readers with plenty to ponder and asks us to, ultimately, come to our own conclusions is what makes it such a strong issue. 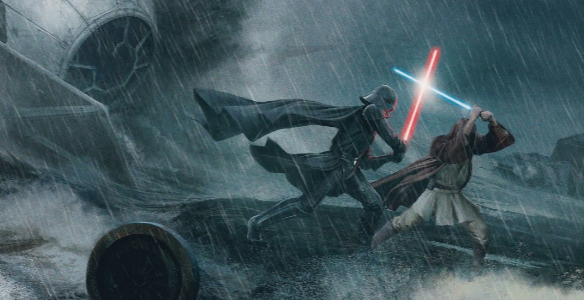 I loved that “You are no Jedi” moment. I wonder if Anakin still feels some kind of attachment to that title. And you’re right that it’s impossible to tell whether he’s being protective of “being a Jedi” or proud of Barr for rejecting his Jedi-ness. I suspect the answer is somewhere in the middle, and Vader is just a swirl of confusing rage around the subject of the Jedi.